A leaked draft of the report, by the government accountability office, the investigative arm of Congress, says the Bush administration has failed to meet the vast majority of military and political benchmarks set by Congress this year. The Greed Zone codel dog and pony show. An American-owned company operating from Kuwait paid hundreds of thousands of dollars in bribes to American contracting officers in efforts to win more than $11 million in contracts, the government says in court documents. Gov. Rick Perry on Thursday commuted death row inmate Kenneth Foster’s sentence to life, following a 6-1 recommendation by the Texas Board of Pardons and Paroles. Mr. Foster is one of an estimated 80 Texas death row inmates convicted under the law; about 20 have already been put to death. Most states have such laws for many types of crimes, but Texas is the only state to apply it broadly to capital cases. While death penalty opponents decry its use, prosecutors argue all those responsible for heinous crimes must be held accountable. 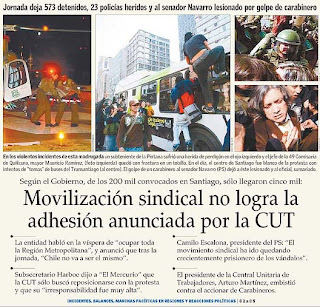 Thousands of Chileans took to the streets yesterday in a burgeoning middle class revolt against the 17 years of coalition government that has ruled since the fall of Augusto Pinochet in 1990. The main trade union federation called the protest, saying the government's free market economic policies have meant poorer conditions for workers. WASHINGTON — In a sign that top commanders are divided over what course to pursue in Iraq, the Pentagon said Wednesday that it won't make a single, unified recommendation to President Bush during next month's strategy assessment, but instead will allow top commanders to make individual presentations. Military analysts called the move unusual for an institution that ordinarily does not air its differences in public, especially while its troops are deployed in combat. "The professional military guys are going to the non-professional military guys and saying 'Resolve this,'" said Jeffrey White, a military analyst for the Washington Institute for Near East Policy. "That's what it sounds like." White said it suggests that the military commanders want to be able to distance themselves from Iraq strategy by making it clear that whatever course is followed is the president's decision, not what commanders agreed on. Chief executive officers from the nation's biggest businesses averaged nearly $11 million in total compensation, according to the 14th annual CEO compensation survey released jointly by the Institute for Policy Studies based in Washington and United for a Fair Economy, a national organization based in Boston. In a speech to US war veterans in Reno, Nevada, Mr Bush renewed charges that Tehran has provided training and weapons for extremists in Iraq. "The Iranian regime must halt these actions," he said. In his speech to the American Legion, Mr Bush hit back, accusing Iran's Revolutionary Guards of funding and arming insurgents in Iraq. And he said Iran's leaders could not avoid some responsibility for attacks on coalition troops and Iraqi civilians. "I have authorised our military commanders in Iraq to confront Tehran's murderous activities," he said. Despite its subject matter, however, Vanishing Point is more than just another website about urban exploration. Cook's accounts of his journeys into the subterranean civic infrastructure of Canada and northern New York State – and into those regions' warehouses, factories, and crumbling hospitals – often include plans, elevations, and the odd historical photograph showing the sites under construction. For instance, his fascinating, inside-out look at the Ontario Generating Station comes with far more than just cool pictures of an abandoned hydroelectric complex behind the water at Niagara Falls, and the detailed narratives he's produced about the drains of Hamilton and Toronto are well worth reading in full. 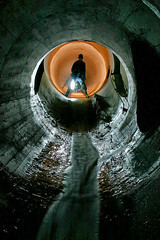 As the present interview makes clear, Cook's interests extend beyond the field of urban exploration to include the ecological consequences of city drainage systems, the literal nature of public space, and the implications of industrial decay for future archaeology – among many other things we barely had time to discuss. Read the facinating interview with urban explorer Michael Cook in BLDGBLOG. Sen. Larry Craig (R-My Own Private Idaho) in denial. Several federal agencies are investigating a widening network of criminal cases involving the purchase and delivery of billions of dollars of weapons, supplies and other matériel to Iraqi and American forces, according to American officials. The officials said it amounted to the largest ring of fraud and kickbacks uncovered in the conflict here. Naomi Klein - Political protesters are now being videotaped under the guise of ensuring their legal right to be seen and heard. What happens when surveillance is billed as the new participatory democracy? 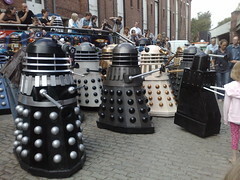 The Museum of Science and Industry in Manchester brought together 67 home-made Daleks on Sunday afternoon. Their original creator, Raymond Cusick, who was there to judge the world record attempt said the initial design 40 years ago was very basic. The museum is currently featuring an exhibition on Dr Who and the Daleks. Miss Teen USA 2007 finalist from South Carolina on Americans' poor geography skilz. President Bush will be in New Orleans on Wednesday to observe the second anniversary of Hurricane Katrina, the White House has announced. Well this news just made my whole day complete, aaaarrrrggggg! Why don't we all just line the streets with our beloved Amercan flag turned upside down in the international sign of DISTRESS! Honeslty, that last thing the people of this city need, with all the frustration of this rebuilding is for W to tie up traffic for hours so that he can have a photo op in some secret location with some probably bussed in supporters...perhaps I'm cynical. Be sure to read Digby's articles Katrina: Slow As Molasses and Katrina: "It's The Blacks" over at the Big Con. SACRAMENTO -- Making good on a promise to trim the state budget, Gov. Arnold Schwarzenegger eliminated a $55-million program Friday that advocates say has helped thousands of mentally ill homeless people break the costly cycle of hospitalization, jails and street life. Among the cuts: $1.3 million to track hospital efforts to eliminate infections, which kill more than 7,000 Californians a year; $30 million for state parks; and $6 million to compel drug manufacturers to discount medicines for lower-income people. He [state Sen. Darrell Steinberg (D-Sacramento)] noted that despite the allegedly strapped conditions of the state, legislators managed to preserve a tax break for some purchasers of yachts, planes and recreational vehicles -- a measure that could cost the state as much as $45 million. "A $45-million tax break for yacht owners stays in the budget," Steinberg said. "And a nationally recognized, incredibly effective program to end homelessness for those living with mental illness gets thrown under the bus."